The Seal of the Holy Spirit is our earnest of redemption and everlasting life by faith in Jesus Christ alone. The Holy Spirit Dove pendant in 14k yellow gold is a beautiful, daily symbol and reminder of our enduring Christian faith. The Christian dove is beautifully diamond-cut on the surface for extra shine when it hits the light, a symbolic reflection of God's glory. The pendant measures 25mm x 15mm in size (1" tall with bale/hoop x 0.60" wide). Make it a necklace by adding a matching 14k gold box chain (optional). 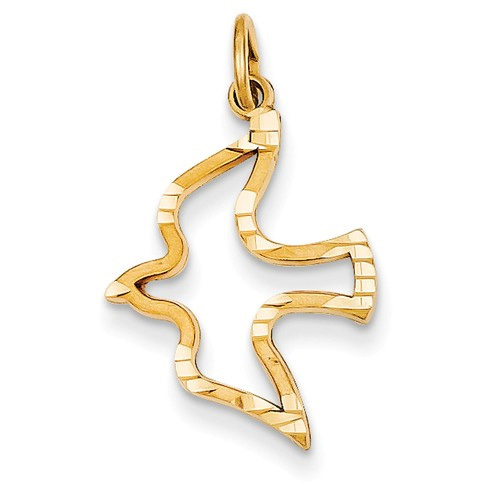 We guarantee our Holy Spirit Dove Pendant in 14K Yellow Gold to be high quality, authentic jewelry, as described above.